The good news is that there are fresh salmon running into Lough Conn. The bad news is they resisted all efforts to winkle them out today! My excuse for the day is the wind, or should I say the almost total lack of it. Overhead conditions were excellent with good cloud cover, some light showers and occasional bursts of sunshine. The water was well up in the lake and fresh water was still pouring in from every stream and river. It should have been a red-letter day but the wind stubbornly refused to blow. Justin and his son Laurie were out with me today. 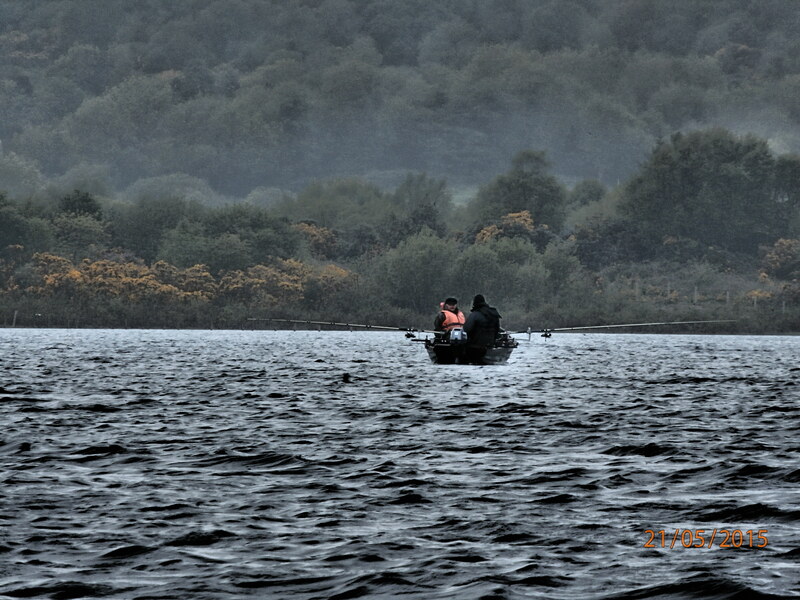 They are no strangers to Mayo but this was their first time on Lough Conn so I was extra keen to find them some fish. The flat calm which greeted us meant we were forced to kick off trolling hardware over the usual well-known salmon lies along the western shoreline. Spoons fluttered enticingly through the shallows but the salmon remained absent until we approached Massbrook Point were some silver lads started to splash and jump. I only got a good look at one of these fish and it was bright and silvery, a fresh grilse straight in from the sea. I covered the area diligently but we just could not get a response from the fish. By now the day was warming up and I decided to turn around and head for the pole outside Pike Bay. If there were salmon at Massbrook there was every chance some were holed up only a mile or two further along. Fly life had been non-existent until we started to motor back along the shore. Sedges, mainly Cinnamon but with a few Green Peters and Welshman’s Buttons began to hatch. I expected to see some surface action from the trout but only a couple of brownies broke the glassy surface in the distance. We hunkered down for the long troll back, following the edge of the deep water and trying to avoid the rampant weed beds which are now a feature of the lough. The faintest of breezes, coming out of the North, got up around 3pm and so we pulled in to set up the fly rods. After the briefest of casting lessons (break the wrist and remember to pause between the back and forward casts) we set off again, leaders adorned with small salmon flies. Some grilse showed close to the shore and I was sure our time was coming but the very next drift saw the meagre wind dissipate completely. Virtually becalmed now, we flogged on, the only tugs on the line coming from the underwater vegetation. In the end we gave up and trolled back to the berth, fishless. Today was an example of how conditions beat us fishers. A steady wind could have transformed the day but instead we were always chasing the ripple. I felt bad for Justin and Laurie, they fished hard and really deserved a fish or two. Could we have tried something different? I had considered switching to the dry fly at one point in the afternoon. I’ve had success on difficult days in the past by switching to small dries fish delicately in the shallows but this is pretty technical fishing requiring good stalking skills and pinpoint casting accuracy. I just felt that today we had a better chance on smallish spoons and Rapalas, covering a lot of ground rather than hammering one spot. In the end we had to admit defeat and retired for the day after 5pm. At least we had seen some salmon moving and that always engenders hope. The reasonable hatch of sedges was also an encouraging sign, especially since hatches have been so poor so far this season. I hope the lads come back again next year and we get better conditions. As for me, I want to head down to the salt water next trip…………………….. The big southerly wind we were promised on the forecast didn’t really materialise after all. 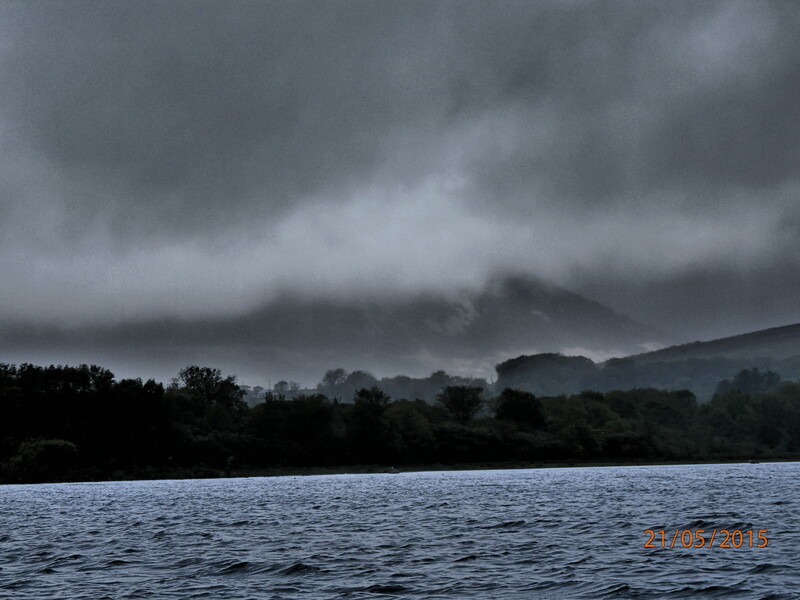 A steady force 5 brought mild, damp air up over Ireland and a good day for fishing. I had semi-packed the gear the night before so it was just some last minute additions that had to be slung into the VW before heading off for Pike Bay. Mayo was verdant and lush around me as I wound along the Lahardaun road with Conn on my right. The car park at Brown’s Bay was busy and lots of boats were already hard at it along the Massbrook shore. Parked up close to the boat, I donned my gear in a heavy shower. This would be the pattern for the day, steady winds and occasional heavy showers. I trolled my way out of the bay and turned left into Castlehill, scanning the surface for any activity as I progressed deep into the shallow waters. No signs of life that I could see but some boats were covering drifts at the extreme edge of the bay close to the reeds beyond the mouth of the Addergoole river. I joined the queue but still can’t figure out why they were combing the water there – not a sign of fly or fish was to be seen! I gave it a couple of drifts then headed out of Castlehill and trolled down towards Massbrook. I saw my first mayfly of the day a few yards from the start of the Cornekillew shore, quickly followed by the first rise too. I pushed on down the shore a bit further before stowing the trolling rod and setting up for a drift to take me back over the spot where I had seen the rise. The wind was difficult as I was alone in the boat and with my weight at one end and just fresh air at the other she tended to dig in by the stern and slip sideways on the wind. I like to use this to my advantage when wet fly fishing on my own and ‘hang’ the bob fly for a long time as each cast fishes out. The wind forms a sag in the line as I am crossing it, giving the fish that extra few seconds to grab the flies. That tactic worked a treat today with browns nabbing a Green Peter on the the bob fly and hooking themselves in the scissors. A couple of smallish lads were quickly hussled to the boat before a better fish made a mistake and walloped the size 12 Connemara Black in the middle. I was thoroughly enjoying myself up until now, but then my good fortune deserted me. I had reached the end of the drift and wound in. Pulling the starter cord on the old Evenrude elicited only a cough and a splutter. I repeated the pull, the engine gave me a similar reply. Hmm, maybe she is cold and needs some choke? Nope, that didn’t work and by now I am well out in the deep water, a few hundred yards from shore. Maybe swearing at the inanimate object might help? Surprisingly, this had absolutely no effect what so ever! Nothing else for it, so I grabbed the oars and bent my back into turning the boat into the wind and rowing hard into the stiff breeze. Some fellow anglers from the midlands who had watched my antics came to congratulate me on my sterling efforts and to see if they could help in any way. I declined the offer as there were fish moving and those lads should be covering trout not ripping an engine apart. Being the owner of old engines I habitually carry spares and tools so I had the Evinrude’s spark plugs out in a jiffy (thinking that she had possibly oiled the plugs). The spark plugs looked good so I decided to call it a day and head back home. It was 2.30pm and I figured I was not going to lose much by that time of the day. Driving home I had time to think about the problem and a duff coil would seem to be the likely culprit today. While it was a shame the day was cut short by mechanical failure I still enjoyed my time on the lough. Mayfly are still scarce but a few are fluttering around now. I will get the engine repaired during the week and be ready to hit the lough again next weekend. The lough is fishing well so if any of you are contemplating a wee trip to Conn the next couple of weeks should be good. Late update: I hear the Castlebar Anglers club held a competition on Conn today. 18 anglers caught 7 trout between them. Out for a few hours on Lough Conn today. Flat calm to start with but a wind came out of the North West later to to give us a small ripple. We were fishing for salmon but only saw 3 coloured fish show outside the mouth of the Deel river. Lots of other boats out – all clean. We need a lot of rain to lift river levels and get some fresh salmon into the systems. Here are some photos of today……………. We fly fished drifting down the pumphouse shore then trolled spoons and rapalas back up wind again. This is an efficient way to offer the fish a wide rage of lures but they were not impressed with our joint efforts today. Ah, the joys of salmon fishing. I heard my first cuckoo of the year while we were pulled into the shore at Gortnore and the woods at Pike Bay were alive with Bullfinches chasing each other through the trees. Over the course of the few hours on the water I saw a total of three mayfly hatch. Early harbingers of more to come. 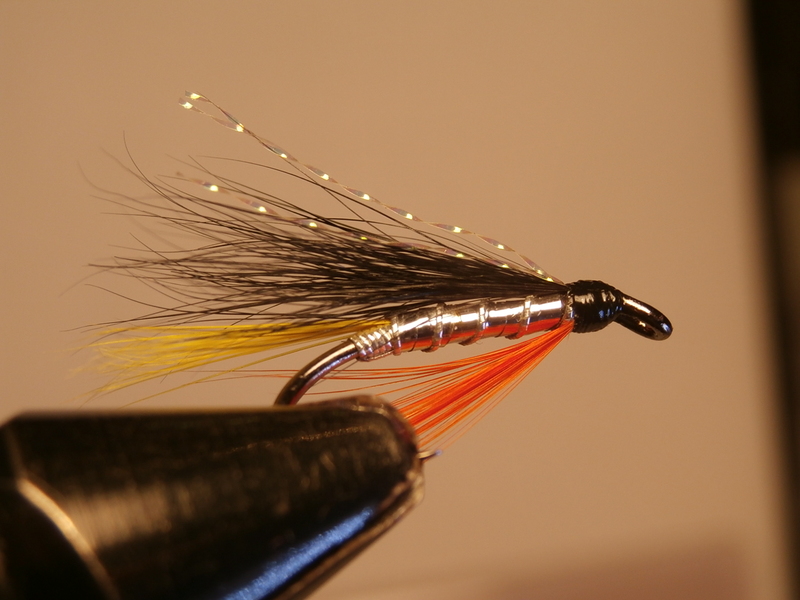 I spent a few minutes at the vice this evening to tie some size 8’s for lough fishing. 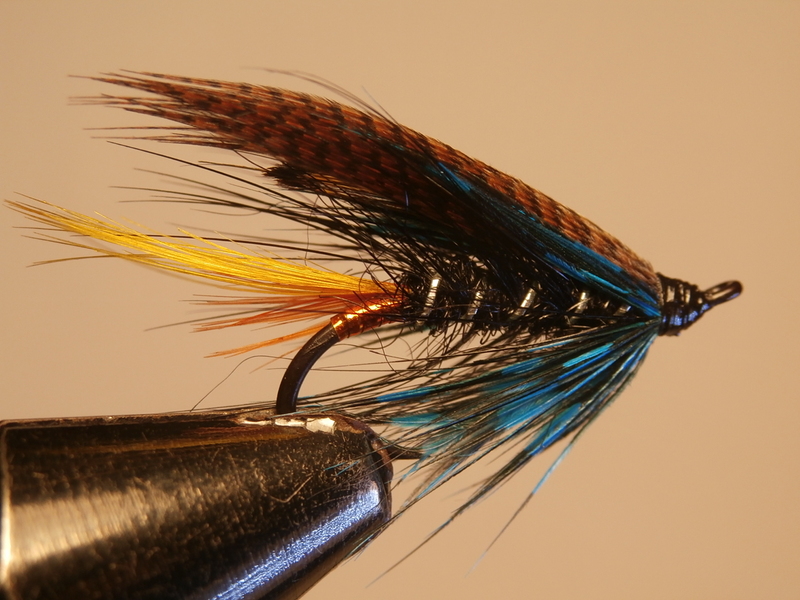 Not that was any great need to tie even more flies, I just wanted to enjoy making some old favourites. I know that I cart around an ridiculous amount of patterns but it is simply the price us fly tyers pay for enjoying both the fishing and the making of the lures. 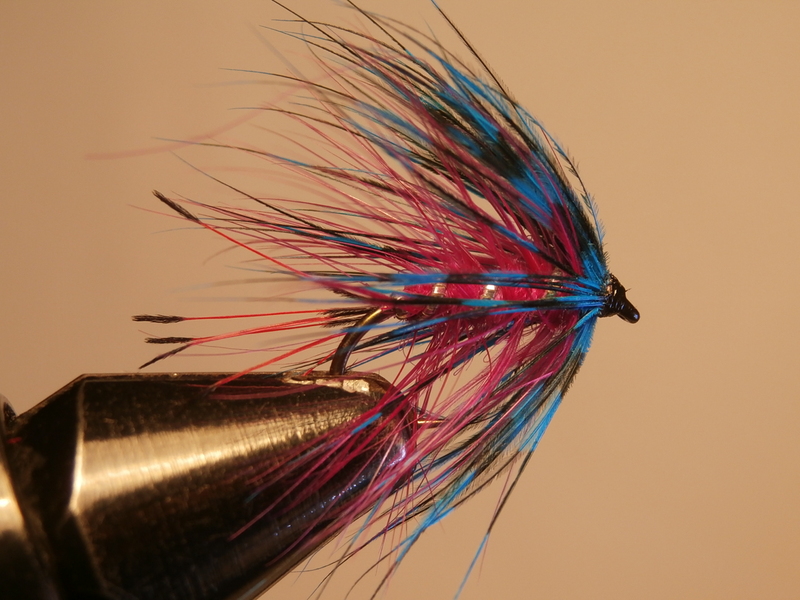 Most of them will sadly never even be tied on to the line, let alone catch a fish, but the sheer enjoyment of sitting at the bench and creating a fly from a bare hook and some feathers is just too much to ignore. 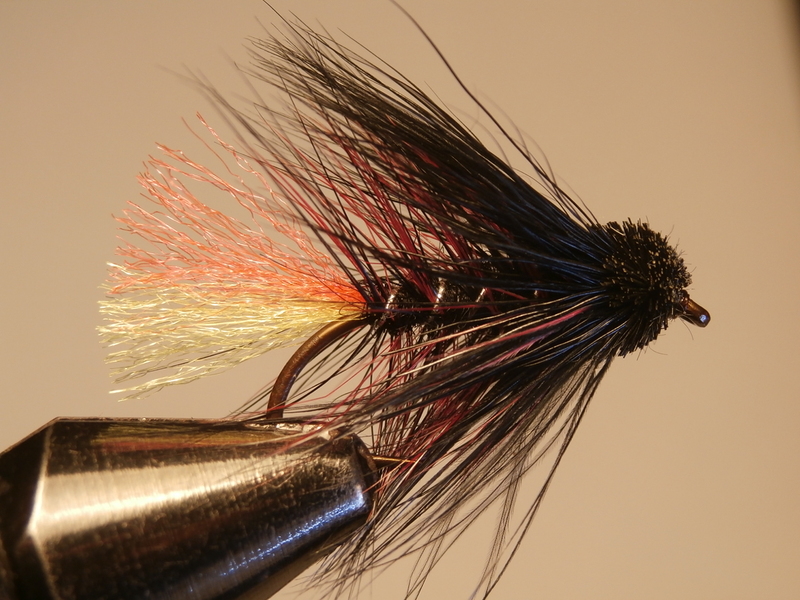 Tonight I kicked off with some Connemara Blacks tied for salmon. What’s the difference? Well, I like to add a bit of colour under the tail so I make a tag from two turns of Opal tinsel and then wind on some Glo.brite no. 5 floss. I rib the black body with flat silver tinsel to give it some extra flash too. I also make an underwing from a bunch of GP tippet fibres. 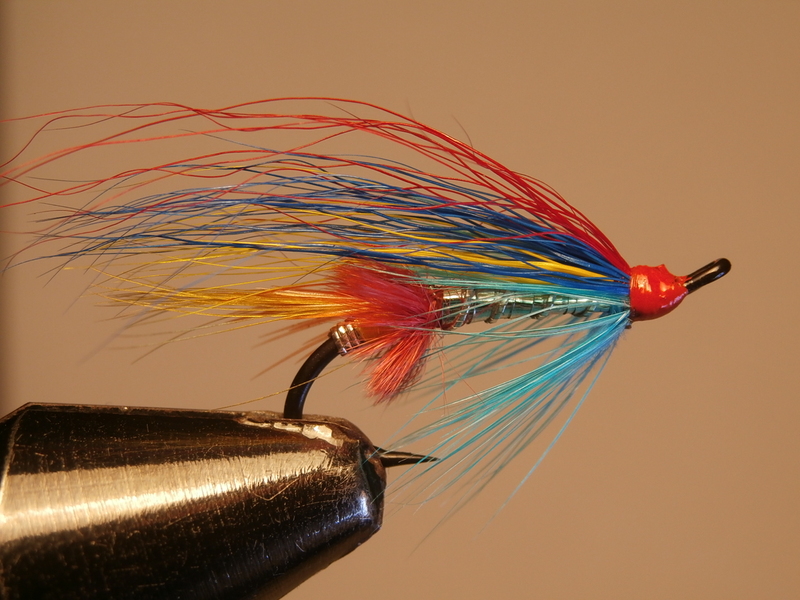 This adds strength and a bit more colour when the fly is wet. Next up was a few of my own version of the Raymond. With this one I add a small tag of Glo-brite no.4 but keep the usual body of golden olive fur and double body hackles of red and golden olive. The normal wing of paired hen pheasant secondarys are followed by a long fibred guinea fowl hackle. I made up some small Green Peters too. Much more delicately dressed, these were busked on a size 12 hook. 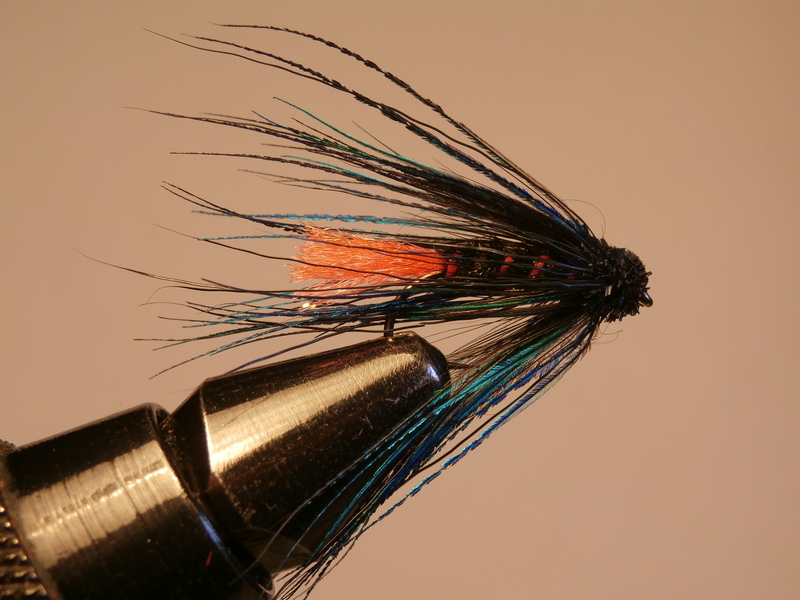 I can’t say there is too much different about this fly except that it is very lightly dressed by Irish standards. 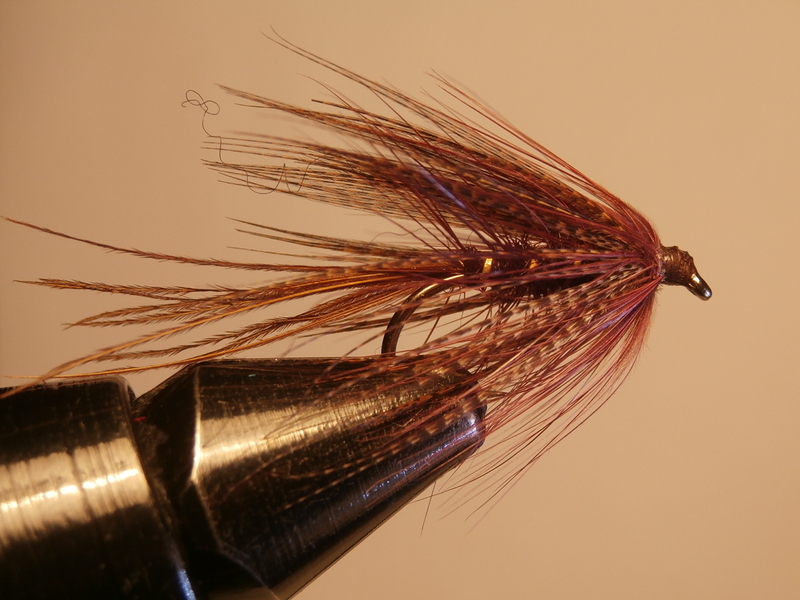 3 or 4 turns of body hackle are all that is required. Finally, I wanted some heavy Green Peters for the tail of the cast when lough fishing for salmon so I made this next pattern up on those lovely Loop heavyweight doubles. 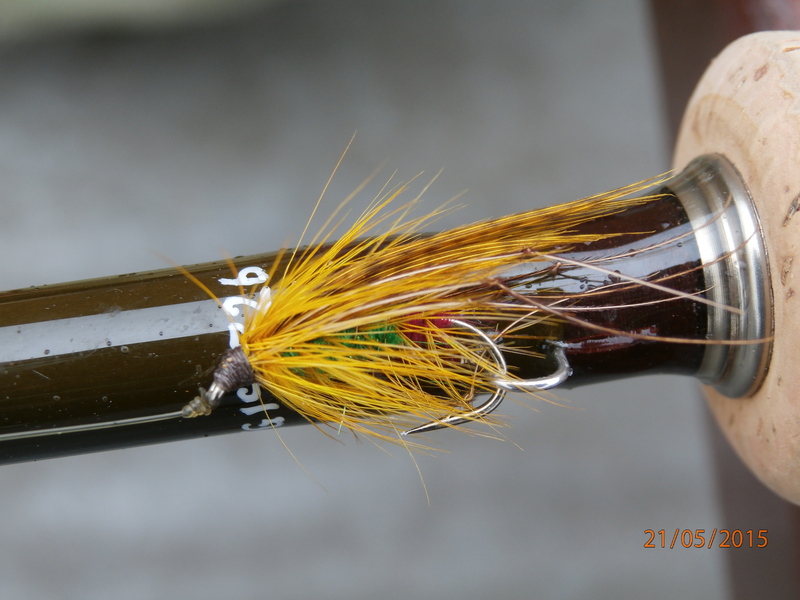 I used a size 10 and made the wing from the ‘bad’ side of a bucktail dyed green. So that was it for the evening, more flies to confuse me and the fish! 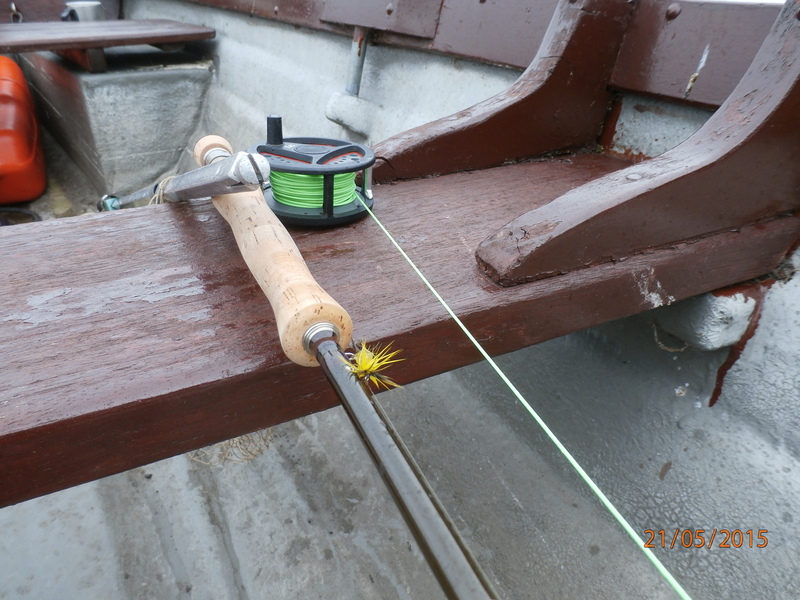 Here are some patterns which have worked for me and my boat partner over the years on Carrowmore lake, Co. Mayo. Claret bumble is the first choice on a dark day with low cloud. The standard dressings works just fine but I like mine to have a Muddler head in either claret or blue. The Clan Chief would probably be the fly most likely to be on my cast on any given day on Carrowmore. It seems to be able to produce fish under any conditions and you really must have some in your box if you are fishing the lake. I personally love a Goat’s Toe with a black muddler head on it. 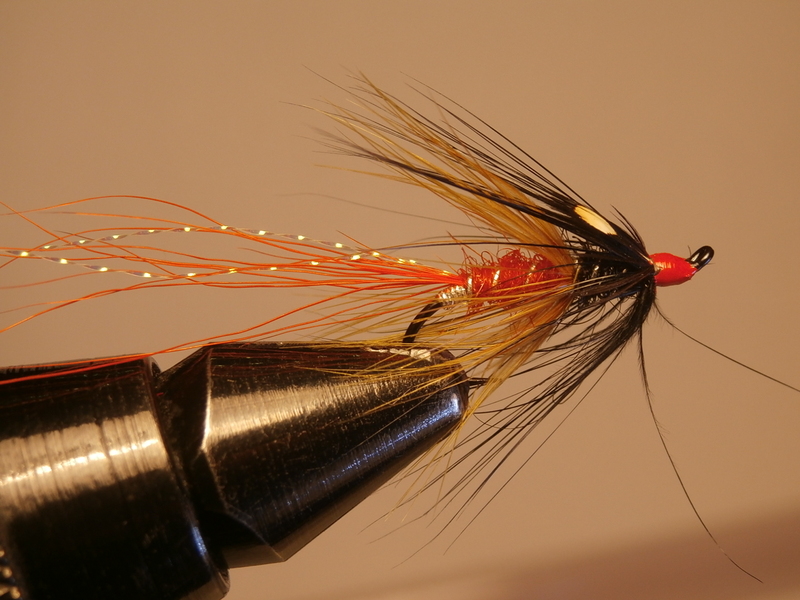 The Golden Olive shrimp has taken many salmon over the past few seasons and the orange tail looks great in the water. I confess that I have never caught a salmon on a Magenta Bumble but I have been in the boat when it has succeeded. One for a bright day in my mind. 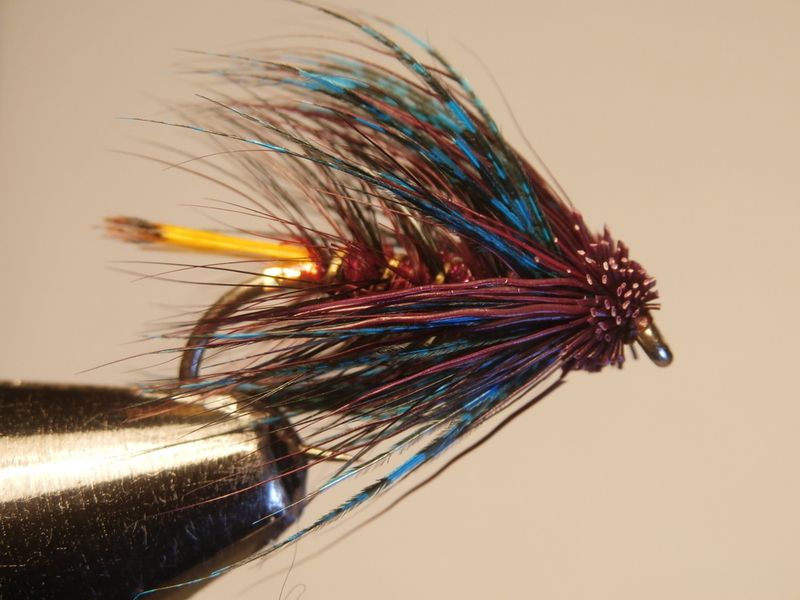 Always worth a try, the Claret Dabbler is an ever present on the cast of many who fish Carrowmore. 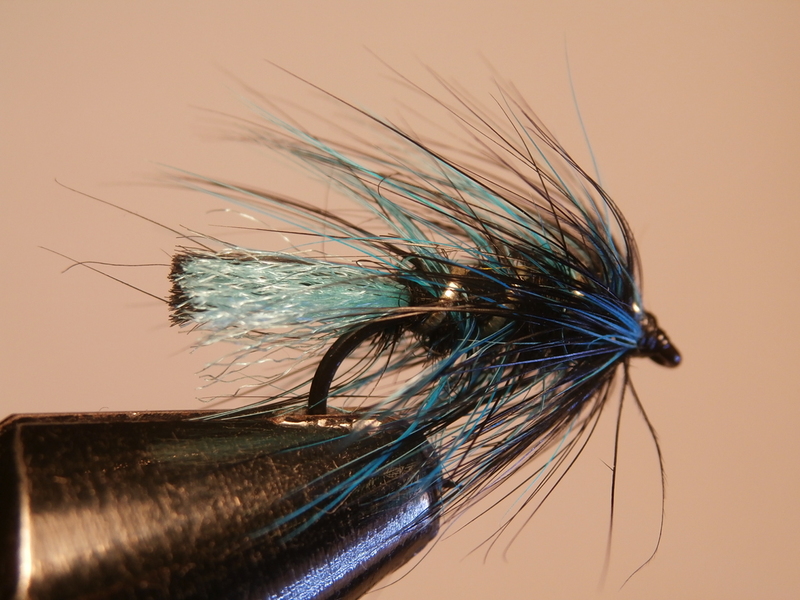 A deep blue hackle is needed for this pattern, much darker than the colour on a teal blue and silver. I prefer a hairwing version of the Doctor, it is tougher than the original feather winged fly. The silver stoat with an orange hackle does good work. I like it on a heavy hook and fish it on the tail off a sinking line. 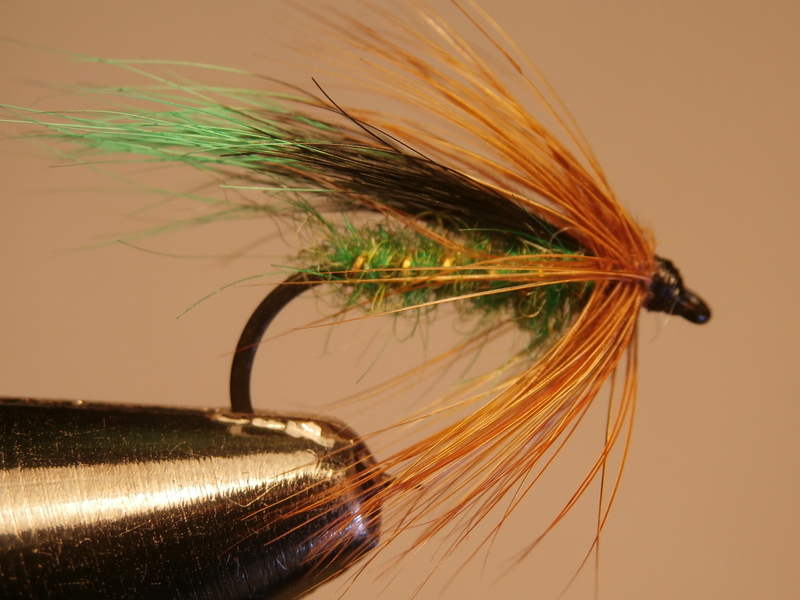 And a Green Peter of course………………this one with a green squirrel tail wing. As you can see, I prefer Black and Claret flies in general. If pressed I would be happy to fish with a Goat’s Toe on the bob, a Green Peter in the middle and a Claret Bumble on the tail. The word on the street was that there were salmon being caught in Lough Conn so I decided to head out today and give it an auld lash. My boat is on Cullin so it meant driving it across Cullin, under the bridge at Pontoon and motoring half way up lough Conn. The journey was uneventful and I was fishing an hour after leaving Healy’s Bay. I had a couple of trolling rods set up and with the engine turning over slowly I set about following the contours of the Massbrook shoreline in the company of a few other like minded souls. Two hours later and there had been no action at all, not even a salmon jumping in the distance. 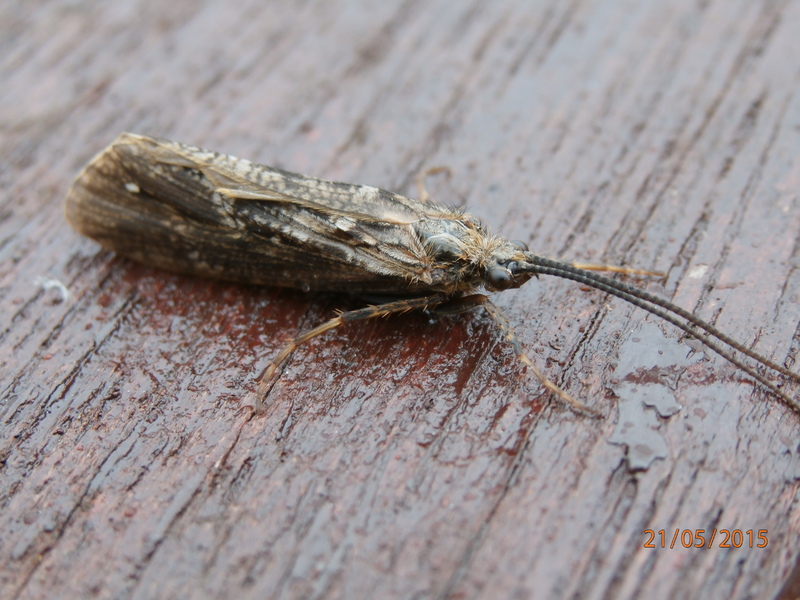 However, the mayfly had been hatching in ever increasing numbers and the trout decided to put in an appearance. The air was full of swallows, martins and swifts chasing the unfortunate greendrakes and now the brown trout started to hammer them from below. Time for me to set up a fly rod, so I pulled into the shore. The first line of attack was a team of three wets. A good, rolling wave and a brisk westerly wind coupled with an overcast sky seemed to point towards the wet fly and sure enough I started to catch a few trout on a yellow hackled Green Peter, one of my own patterns which I especially like for Conn.
Trout were showing all over the lake now and takes were coming thick and fast. The only problem was the size of the fish, they were all between 12 and 14 ounces. This took me back a few years to when Conn produced great fishing for trout of this size. Later the average size increased dramatically but the fish were much more scarce. Maybe nature is reverting back to the old days. Anyway, I decided to change to the dry fly as the trout were obviously taking the duns as the sat on the surface drying their wings. 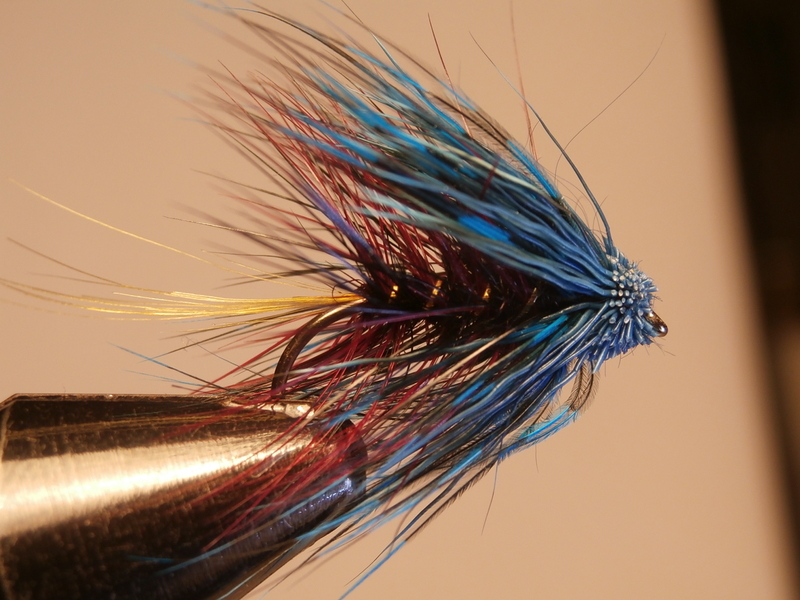 I changed the cast and tied on a couple of dries. When I reached into my bag for floatant I came up empty-handed – no Gink! 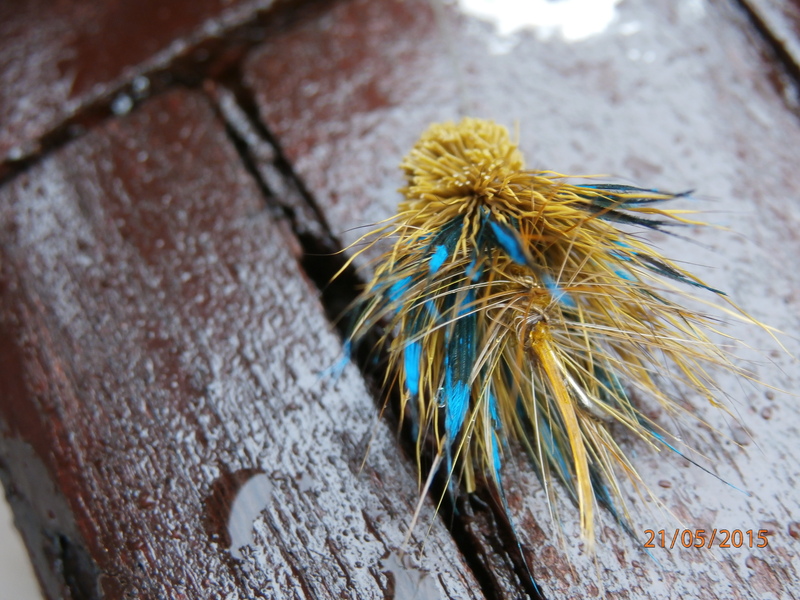 OK, I would try fishing the heavily hackles flies without waterproofing. I flicked out a short cast with untreated lies and the Yellow Wulff was snapped up immediately by a lively three-quarter-pounder. The Wulff was a bedraggled mess by the time I had freed the tout and popped it back into the lake. I needed to find some floatant urgently. 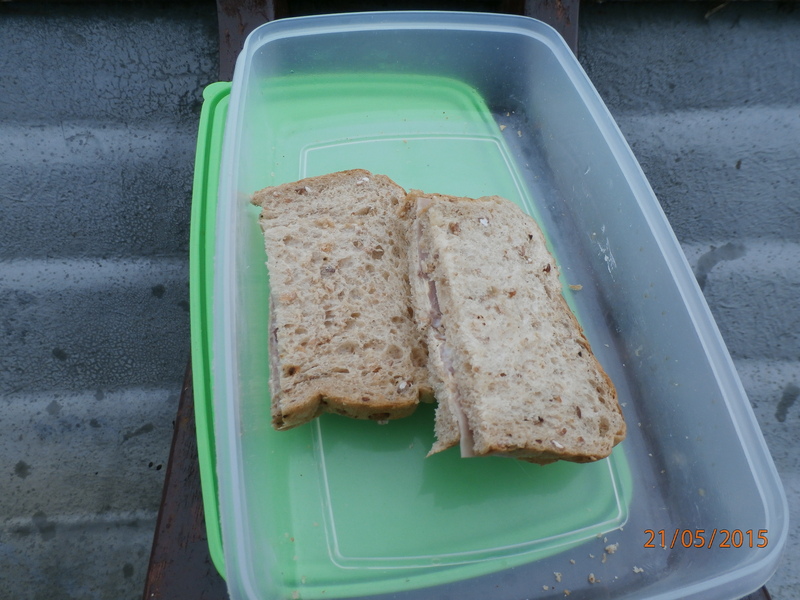 Ham sandwiches, that staple of the anglers lunchbox came to my rescue. I had a couple of rather sorry looking examples of porcine slices ‘twixt granary bread lurking in a box. The bits of pig were not my focus of attention, it was the butter which fired my imagination. Surely a dab of butter worked into the dressing of the flies would aid them to float? I had never tried it before but lacking any other suitable material it was worth a bash. I scraped some butter from a sandwich and rubbed into a Wulff. At first it looked to be a disaster but when the butter melted it soaked into the yellow fly and seemed to be OK. Feeling rather pleased with myself I set off on the next drift. A Yellow Wulff lathered in butter! There was a good wave now and the flies would sometimes disappear from view behind a wave. After only a few casts the Wulff disappeared OK but in the middle of an impressive swirl. I tightened into the fish and played him out but the fly came out of him mouth at the side of the boat. No matter, it was only a small lad. The question was was the fly still going to float? You bet it did! It fairly bobbed about on the surface and tempted another half-a-dozen trout before I called it a day. As I was tidying the boat to prepare for the long run home to Healy’s Bay I noticed a large, brownish fly on one of the seats. The first Murrough of the year. OK, so I didn’t catch a salmon and the trout I boated were of humble proportions. But still it was a great day to be out between wind and wave (just where Admiral Lord Nelson liked his grape shot to arrive). I will be dropping into Frank Baynes tackle shop for some Gink before I venture out again though!